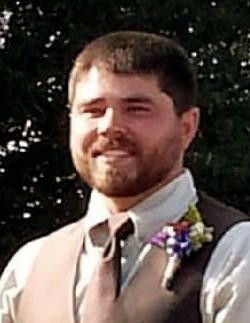 Herington - Lucas Charles Hicks, 28 of Rural Hope, Ks was called to Heaven on Saturday August 18th, 2018. Lucas was born on May 28th, 1990 to Charlie and Kim (Cox) Hicks. Affectionately known as “Pookie” a nickname his older sister Kate started in childhood and quickly caught on. He was a 2008 graduate of Hope High School, where he was a standout football player for the Hope Lions, proudly wearing the #33, following family tradition. In high school, he began dating Katelyn (Sly). Their first date was October 8th, 2006, and after eight years of dating Lucas Charles and Katelyn Renee exchanged vows and were joined in marriage on October 4th, 2014 with a pasture wedding ceremony on the Sly Farm. On February 9th, 2016 they excitedly welcomed a daughter, Gentry Kam Hicks, who today is two years old with curly auburn hair, brown eyes, dimples, her mama’s mini with her Daddy’s laugh. He taught her his love for football, especially the Green Bay Packers, and Gentry already knows to chant “Go Pack Go!” Lucas’ love for his Wife, Katelyn and their daughter Gentry was strong and true. He adored them both and was a proud husband and father. A friend to many, he enjoyed spending weekends at the lake with family, or hosting cookouts at his home that usually ended with music and laughs around a fire. If Lucas was laughing, you could be sure everyone around him was laughing too... whether something that happened was actually funny or if it was Lucas’ laugh that made them laugh. His was certainly one of a kind accompanied by a genuine smile. In Lucas’ career at Agri-Trails Coop, he had not only co-workers, but lifelong friends, many who watched him grow up, or grew up with him. Lucas was a caring son, loving brother, true friend, devoted husband, and amazing Daddy. He leaves behind many loved ones to include: A Wife, Katelyn Hicks and a Daughter, Gentry Kam Hicks both of Rural Hope, Ks; Parents, Charlie and Kim Hicks of Hope, Ks. Siblings, Brother, J.R. (JoAnne) Hicks of Colorado; Brother, Jesse (Louise) Hicks of Little River, Ks; Sister, Jamie (Shaun) Minor of Dodge City, Ks; Brother, Zachary (Sonia) Hicks of Little River, Ks; Sister, Kate (Jeff) Lewis of Fountain, Colorado; Paternal Grandmother, Agnes Hicks of Logan, Ks; Grandmother, Joyce Cox of Abilene, Ks; Loving in-laws; 9 nieces and 7 nephews; Numerous extended family members; and an uncountable amount of friends. Memorial services:Open visitation Thursday August 23rd, 2018 from 5:30-8:30 pm at Zeiner Funeral Home in Herington, Ks. Celebration of Life Service Friday August 24th, 2018 10:00 am at Herington Community Building in Herington, Ks led by Pastor, Stan Norman. Following the service a balloon release will be held on the Hope High School Football field in Hope, Ks. Memorial contributions may be written to “Katelyn Hicks”. These funds will be used for future education expenses for Gentry Hicks.